Welsh Premier side TNS are to share Edgar Street after agreeing an initial one year deal. The Welsh league leaders are in need of a new home to qualify for next season's 'Super 12' league reformat. They were turned down for a grant to build a new 1,000 seat stand at their current Park Hall ground in January. A move to lodge with Chester failed due to the insolvency of the Cheshire club, while a similar deal with Shrewsbury fell apart when the local council demanded 'a substantial figure' to operate the necessary park and ride system to service matches at the out of town stadium. The Edgar Street deal is for an initial season while the club hunt new funding for their stand. They are hopeful of agreeing a new corporate sponsorship that will see the club's name change again, having changed from Total Network Solutions to The New Saints when the telecoms company was swallowed by BT. The club will continue to train and play reserve matches at Park Hall, using Edgar Street on Matchdays only. The Bulls' fixtures will get priority over the tenants, while the financial implications are beneficial to the Bulls' budget for the coming season. The deal is believed to be worth up to £1,000 a match to the Bulls, with TNS providing their own matchday staff, and the Bulls will retain the income from sponsorship boards, catering, and bars. On-loan Bull Lee Morris scored his second goal for Forest Green as they beat Barrow 1-0. Morris, an unused sub in the last match, came on as a 74th minute sub and scored with a drive from outside the box ten minutes later. The win pulls the Gumpers out of the Conference relegation zone for the first time in several months. Monday 5th April 2010 Kick-off 3.00 pm. The Bulls travel to the Darlington Arena on Monday to take on a Quakers side all but doomed to Conference football next season. The ground is currently known as the Northern Echo Arena and is a modern stadium opened in the summer of 2003 and situated on the edge of the town on Neasham Road. It is completely enclosed and all seated providing accommodation for around 3000 visiting fans in the East Stand at one end of the ground. The facilities for fans inside the stadium are very good with a large concourse providing room to move around with your carefully selected beverage and hot pork pie. Admission: - Adults £18, Seniors £12, Students £12, Children 10-16 £8 and U10’s £5. Early bird tickets can be purchased on-line or by phoning the Darlo ticket office on 0871 855 1883 and show a saving of £2 per person. Tickets are not available through HUFC so fans must contact the Darlo ticket office to take advantage of the discount. Family tickets (2 Adults and 2 children) are available for £45 - £40 in advance). There may be a charge for credit card purchases. TRAVEL BY CAR….Join the M5 North at Worcester then at J4A join the M42. Continue to the end of the M42 and join the A42 before joining the M1 North and then the A1(M). Leave the A1(M) at Junction 57 and take the A66 towards Darlington/Teeside. Continue straight along the A66 going across two roundabouts. At the third roundabout you can clearly see the stadium just over on your left. Turn left at this roundabout into Neasham Road for the stadium. Parking at the ground costs £5 per car but there is some street parking as you continue passed the ground towards the town. The postcode is DL2 1DL and distance is just over 230 miles from The Street. You should allow a drive time of four and a half hours at least. HUISA – Departs Radford’s at 08.30. Fare £25 (members £24). Bookings through Club office (08442 761939). REFRESHMENTS…There are a couple of bars at the ground which both allow visiting supporters as well as watering holes within the concourse of the stadium. For those who want to venture into the town, the usual fare can be found at the local Wetherspoons outlet, which trades as The William Stead in Crown Street. There is a veritable clutch of good Real Ale Pubs in Darlo and a personal favourite is the Number Twenty 2 in Coniscliffe Road. Other gems include Quaker House in Mechanics Yard of High Row while The Britannia in Archer Street was the 2005 Darlo Camra Pub of the year. If in doubt, head for the Market Square where you will find a good selection of alehouses including the excellent Hole in The Wall, which has several pumps, Sky TV and does highly regarded Thai food at reasonable prices. The Roundabout Chip Shop can be found about half a mile from the ground up Neasham Road towards the town centre at 366 Yarm Road. Enjoy…..and three more points please GT! Mark Cooper is reported to be a possible candidate to take over the vacant manager's post at Hereford United. Asked by PA Sport about the Hereford vacancy he was reported to have replied "That kind of job would definitely interest me." Below is a look at his career to date. Mark Cooper was born at Wakefield, West Yorkshire in 1968. His father was the former Leeds United player Terry Cooper. Cooper started his football career as a trainee with Bristol City in 1987 but it wasn't until he moved to Exeter two years later that he made his debut at first team level. In September 1991, Cooper moved to Birmingham City where he played a total of 39 games, and scored 4 goals but a year later he was transferred to Fulham for £40,000. However he failed to play regularily for the Cottagers and went out on loan to Huddersfield in 1993.
Cooper moved to Wycombe Wanderers for a month in January 1994 and then back to Exeter where he seldom missed a game over two seasons. In July 1996 he was transferred to Hartlepool United where he made 31 appearances and scored 9 goals. A year later he went on loan to Macclesfield where he played eight times. Then it was back to London and a spell with Leyton Orient before joining Rushden and Diamonds for nearly two seasons. In 2000 he moved to Hednesford and then Forest Green Rovers in March 2001 where he later became club captain. In May 2002 he was on the move again, this time to Tamworth where he was appointed assistant manager a year later. Finally he took over the managership in summer 2004. As a manager he had some success with Tamworth particuarily in the FA Cup. In two successive seasons he took them to the third round. However he couldn't repeat that success in the Conference League and in 2007 with the club on the bottom spot he left by 'mutual consent'. Days later he was appointed as manager of Kettering Town who at the time were in the Conference North. It took him just one season to get them promoted and as well a fourth round FA cup-tie against Fulham. In November last year Peterborough United came calling after Darren Ferguson had left and Cooper signed a three and a half year deal to manager the ambitious Championship club. At the time Posh chairman Darragh MacAnthony seemed pleased with Cooper's appointment. "People say he has got no experience but Darren Ferguson hadn't managed in his life before he came here and look at the job he did," said MacAnthony. "I think Mark Cooper will do a terrific job for our football club. "He could only work with what he had got at Kettering but the players fought for him and they were organised, whereas we are probably lacking a bit of organisation. "In the Championship you need to battle and grind out results and the players will have to work hard for their places. "But he has said he gives everyone a clean slate, so now the players have got to go out there and impress him and win games. "And if they don't and he needs to go out and bring in players then I will back him." It didn't work out and Cooper was sacked on February 1st after just twelve games in charge. However Cooper thinks he has benefitted from his short time at London road. "I'm still young for a manager. I've managed in the Championship at a young age and learnt a lot about how to deal with people, up as well as down in the club like directors of football and chairmen," he said. "I've learnt a great deal from it and it will stand me in good stead for years to come." Hereford United have announced that supporters who are under 10 can obtain £3 tickets for Saturday's League Two match against Barnet until 12 mid-day on Saturday. The decision to allow tickets to be purchased on Saturday morning has been taken because the office will be closed on Good Friday. Please note that the club says the office will only be open from 11am on Saturday morning thus giving supporters just one hour to purchase tickets. To obtain a ticket for a supporter under 10, an adult ticket must be purchased at the same time. Dan Preston who is currently on a youth loan scheme at Edgar Street turned out for his parent Club’s reserve team last night in a match against the Arsenal second string. The Gunners ran out 3-1 winners with Preston playing the whole 90 minutes. Former Bull’s loanee Jordon Mutch, currently at Doncaster, also featured for the Birmingham outfit. The Northern Echo says Mark Cooper has pulled out of the race to be Darlington's next manager after accepting a new job. The paper adds that Cooper's intended destination is either Edgar Street or former club Kettering. Darlington themselves are said to be ready to name their new boss before the weekend, with Simon Davey replacing Cooper as front runner. The announced move of Barnet full back Ahmed Deen to Dover has fallen through as Conference rules say Dover can't loan a third player from a single club. They already have Daniel Leach and Joe Tabiri from the Bees. Port Vale boss Micky Adams has denied rumours of a disagreement with the board over club finances. Adams has told trialist striker Chamal Fenelon to work on his fitness and he may have another look at the non-leaguer again in the summer. Leigh Genesis are expecting to leave their Leigh Sports Village home after less than two seasons as the cost of hosting matches at the 12,700 capacity stadium for gates of 300 was unacceptable. They are likely to move to nearby Atherton LR and upgrade the ground for Unibond League use. Bradford winger Scott Neilson has extended his loan spell at Cambridge until the end of the season. Sky Sports are again reporting that Southend have failed to pay the wage bill on time for the fourth month running. Tuesday May 4th as been chosen for a cider sit-in by local publican, Matt Slocombe, owner of the Crown Inn, Woolhope near Hereford. "I have been championing the benefits of local cider for years now and this insane duty rise has prompted me to do something about this Governments’ decision," Slocombe told the Morning Advertiser. "I jokingly mentioned to a local supplier that we should get a bit ‘French’ about it and move our garden tables into the road and have a glass of cider to protest at the treatment of cider, but also the pub trade in general. "I think we can get around 200 pubs involved by 4 May." Karl Evans from Greater Manchester is set to referee Saturday's League Two match between Hereford United and Barnet. The Bulls has already met Evans once this season. That was at Crewe last August, a game which the Bulls lost 1-0. Both Tristan Plummer and Craig Jones were booked that afternoon. To date this season Evans has been in charge of just 22 games in which he has given out 71 yellow and 3 red cards. Next Monday when the Bulls play at Darlington Paul Tierney is expected to be the referee. Tonight's only League Two match, Accrington vs Barnet, was called off less than an hour before kick-off due to a waterlogged pitch. In the Conference the title is Stevenage's to lose after they beat Oxford 1-0, in front of 5,744, to open up an eight point gap on the U's. Luton are now second after a 4-0 win over Salisbury, in front of 6,692, with the Hatters five points behind having played a game more. At the bottom of League One Oldham lost 3-2 to Brentford. The Latics remain just two points clear of the bottom four with one game in hand over all their rivals apart from Tranmere. The FA have turned down the appeal by some Conference clubs to overturn the removal of Chester's record. The clubs claimed a precedent had been set meaning all clubs with games due to be played against a departed side would get three points, with the existing playing record remaining intact. That point was never argued as the FA decided the appeal had come too late to be considered. The clubs claimed the decision was made to remove Chester's record on March 8th, the day Chester's record was removed, but the FA found that the original decision and announcement was made on February 26th - meaning their appeal was outside the 14 day time limit allowed. The eight clubs remaining from the original claimed ten, with Barrow denying involvement and Crawley withdrawing earlier today, are unlikely to press the matter any further due to the financial implications. The decision means that Stevenage still hold a five point lead over Oxford, with the pair meeting at Broadhall Way tonight. Luton, who have played a game more but are level on points with the U's, are at home to Salisbury. The new stand shape is defined by a truthful reference to the building structure. There is no existing architectual vocabulary which reference can be made to in the existing stands and as such it is considered that the new stand can make a statement without particular reference to existing building structures. Materials have been chosen carefully to provide a durable performance with colour reference to the football clubs home strip, black and white. The lower 2.5m of the stands facade will be hidden behind the existing brick perimeter wall which is to remain as existing. When designs are prepared for the potential development of the available development land to the rear and sides of the stand it is more than likely that the stand will not be visible from the Blackfriars Street and Edgar Street, these views being blocked by subsequent buildings. Roof - Polyester powder coated trapezoidal roof sheeting. Roof edge trims to be powder coated grey aluminium. External Walls - To the height of 2.7m above ground level building to be clad on gabels and rear with Forticrete Twinlock concrete blocks to give stock pattern with textured finish. Side gabels to be glad with polyster powder coated profile sheeting (colour-white). All exposed steelwork to be painted white. Galvanised metal guarding to be painted white with infill perforated galvanised panels painted grey. Generally seats are to be UPVc (colour-black) with galvanised metal frames powder coated paint finish (colour-black). Club initials HUFC to be dipicted with white seat covers and backs across the middle section of the stand. The new stand will be accessed via existing turnstiles block 3-6 located on Blackfriars Street. Three turnstiles are required to serve the stand capacity of 1587able-bodied spectators based on a flow rate of 660 spectators per minute as defined by the Guide to Safety at Sports Ground (Green Guide). It is proposed to modify and extend turnstile 3 to form a new designated disabled wheelchair entrance. The route from turnstile block 3-6 to the stand concourse entrance will be secured with 2.5m high security fence to prevent spectators into the groundstaff compound area located to the rear of the stand. This area measures 199m and will act as an external concourse space, albeit not covered. Alternative means of exit from the new stand are provided at each gable end. It is proposed to construct a new emergency vehicle access route and gated entrance at postion adjacent to the Club Community Office with the new route down the side of the new stand along the eastern side onto the pitch area. A defined route of clear width 3.7m can be provided along this route. Rotherham have already started selling tickets for their trip to Edgar Street on the last day of the season. The game is likely to be crucial for their promotion hopes with the Millers currently lying fourth in the table, two points short of an automatic promotion spot. Millers boss Ronnie Moore has criticised Notts County striker Lee Hughes after the player goaded fans during their match on Saturday. Shrewsbury boss Paul Simpson has blasted his own fans after they criticised his team during their 2-0 loss to bottom club Darlington at the weekend: "It's diabolical that sane human beings come in with that sort of mentality." Barnet have loaned full back Ahmed Deen to Dover for the rest of the season. He has not played for the first team since Adam Lockwood arrived at the club on loan. Referee Mark Halsey makes his return to League action after battling cancer tonight when he takes charge of Accrington's match with Barnet. Halsey, a former Spurs trainee goalkeeper, was a Barnet player in the early 1980's. Bournemouth are to sign Reading striker Andrew White on loan for the rest of the season. The deal was done before last week's deadline, but is yet to be ratified by the Football League as they had not agreed to lifting the embargo at the time. Crewe will record 'significant losses' this season unless they sell players in the summer window. They have already indicated that budgets will be cut in the summer, and only previous player transfers have kept them in the black in recent seasons. Lincoln will host a benefit match for Keith Alexander's family on May 3rd. The game will see a team of Alexander's former players face an all-star side managed by Paul Ince and Barry Fry. Bradford are to seek out new training facilities as part of the ongoing negotiations to secure Peter Taylor as their long term manager. The Bantams will also dig up the Valley Parade pitch after it was criticised by home and away players, but cannot afford the £500,000 cost of replacing the 1920's drainage system that is the root of their problems. Millwall have posted a trading statement saying they have a 'small reduction' in losses for this season so far. They lost £5.2million last season. Lincoln have released 31 year old midfielder Stefan Oakes by mutual consent. Reported as the highest paid player at the club by the local press, Oakes has started less than half the games during his two year spell due to injuries. Cheltenham have loaned defender Kyle Haynes to Gloucester on work experience. Bournemouth have confirmed that midfielder Mark Molesley will miss the rest of the season with the foot injury that has kept him out for five months. The Cherries are to rename their North Stand as the Steve Fletcher Stand for the next five years in recognition of the veteran striker's service to the club. Meanwhile their supporters trust has called the board's reaction to their donation scheme 'overreaction and scaremongering'. Gary Johnson, the former Yeovil and Bristol City manager, looks in line to become the new manager of Peterborough. There had been some speculation that he might have been a contender for the vacant manager's post at Edgar Street but it was always on the cards he would get another job with a higher grade side. Meanwhile, another perhaps more likely contender Mark Cooper seems very hopeful he will soon be in charge at Darlington despite the odds-on probability they will be in the Conference next season. "I’m ambitious and want to get back into management and want to get back to winning games which is what Darlington need to do," said Cooper. "I know the division that they are likely to be playing next season, I know the players and I know what you have to do to succeed." Finally Dean Holdsworth who is in charge at Newport County has declared he is staying with them next season for their first campaign in the national conference. "I’ll be in the manager’s chair next season. We have achieved great things at this club and I hope that will continue next season." So Holdsworth can be crossed out Graham Turner's list, always assuming he was ever on it. Cheltenham have confirmed that they are to share their Whaddon Road home with Gloucester City for the next two seasons. Gloucester council have put £20,000 in to seal the deal. Notts County striker Delroy Facey was arrested on Saturday night on suspicion of assault after a man was stabbed. The club have acknowledged the arrest, but will make no further comment at this stage. Accrington have assured local residents that their new Police control room would be built after the club applied to extend the use of their current temporary cabin. Planning permission has not been applied for to build the new structure, and they have previously been refused permission to use the current cabin past May 10th. They need a control room to comply with FL requirements. Dagenham's slim hopes of a play-off spot have been dealt a blow after Plymouth recalled midfielder Yoann Folly from his loan at the club after seven games. Forest Green are offering ten year season tickets for two people for £5,000 in a bid to clear their debts. Southend have denied that David Webb had quit the club after a 'club insider' told the press he hadn't been seen at the club for over a week. The club says his role is flexible to meet his business interests. Stockport's Administrator says there is a new bid in the offing. Former Chief Executive Sean Connolly and fans march organiser Dave Schofield are said to be leading the bid with the Jim Melrose offer 'dead in the water'. The Bulls' official website has confirmed Adam Bartlett's contract extension, and that Ryan Valentine has triggered his renewal clause. As reported here earlier in the month both had clauses in their contracts for new deals when they reached a certain number of games. Bartlett confirmed at the weekend that he had triggered his extension, while Valentine triggered his clause at the weekend. It is interesting to note that none of the clauses included Johnstones Paint Trophy games in the number of matches. Also confirmed today is an extension to the loan of Dan Preston from Birmingham for another month. The Darlington Official Site is offering a discount worth £2 per seat for tickets bought and paid for in advance of the Easter Monday clash with The Bulls at the Northern Echo Arena. Matchday prices of £18 for adults, Concessions £12, U16’s £8 and U10’s £5 are all reduced by £2 if bought before the day of the game. A family ticket (2 adults and 2 children) is also available for £40 rather than the matchday price of £45. Separately, Darlo are promoting “Kids for a Quid” for all U16’s although U10’s must be with a full paying adult. Tickets are not available through the HUFC offices. HUFC fans wishing to take advantage of the savings should call the Darlington ticket office on 0871 8551883 between the hours of 9.00am and 5.00pm Monday to Wednesday and 9.00am and 6.00pm Thursday to Friday. Meanwhile, HUISA have announced details of their plans for coach travel to the match. The coach will leave Radford’s at 8.30 am with a fare of £25 (Members £24). Seats can be booked in Radford’s before the home game against Barnet on Saturday or through the Club office (08442 761939) during normal hours. Grimsby are odds-on to be relegated to the Conference - and bookies aren't even taking bets on Darlington anymore. The Mariners are 2/5 favourites to join the Quakers in the fifth tier next season. Torquay, six points and nineteen goals better off, are 9/2 with Cheltenham, four points, one game, and nine goals better off, are 5/1. The bookies don't think any other side is now seriously involved in the scrap at the bottom. Maccclesfield are 33/1, Barnet 40/1, Lincoln 50/1, and the Bulls are 66/1 and the last team to be quoted in the list. At the other end of the table Rochdale are now 1/100 for promotion, with Notts County 1/7. Bournemouth are 11/10 with Rotherham 5/4 and Bury 2/1. Shrewsbury have drifted as far out as 16/1 after being 6/1 before their weekend loss to Darlington. At the foot of League One Stockport are also written off by the bookies, with Wycombe, Exeter, and Southend all odds-on to join them. In the Conference Stevenage are 1/7 to win promotion, with Oxford 7/4. Luton, who have scored 14 goals in their last two matches, are 2/1. Conversations with Chesterfield fans yesterday suggested that there may be some talks going on regarding the possibility of Rotherham leaving The Don Valley in favour of Saltergate when the Spireites move to their new home next season. The Millers are without a ground of their own since leaving Millmoor and are some way from complying with the Football League directive that they should return to Rotherham within four years. It may be that Saltergate is seen as a less expensive option than the 25,000-seater Don Valley Stadium although it’s uncertain what condition the Chesterfield ground will be in once The Spireites vacate it with most of the equipment. It seemed an unlikely combination but there's little doubt that both the Turner Factor and the penalty awarded to the Bulls by Andy Woolmer were plus points in the match at Chesterfield yesterday. Bulls News mentioned the Turner Factor last weekend after the Bulls had defeated Bradford City but we didn't expect to add the name of Woolmer to the credit list this weekend. However it was Woolmer's decision to award the Bulls a penalty in the 48th minute, when Marc Pugh was brought down and loanee Jake Jervis had coverted, that gave the Bulls the lead they deserved. Television replays may show differently but several Hereford United supporters sat in line with the penalty box thought that Pugh was just outside the area when the challenge occured. Later Woolmer decided not to give Jervis a second yellow card when it looked quite likely. His first card was for delaying a free kick. Minutes later he kicked the ball away after Woolmer had stopped the game. Another referee on another day might have given Jarvis his marching orders. However Woolmer certainly didn't get much else right as our match report explained. He could have red-carded Phil Picken when he brought down Marc Pugh. More to the point was he trying to balance his decisions when he gave Chesterfield a penalty late in the game? It did look as though loanee Lewis Young might have got the ball, Woolmer decided otherwise. As regards the Turner Factor, one noticable improvement from last week to this is that Mathieu Manset has learnt to jump for a header. Not that high as yet, but at least with his two feet off the ground. And as captain Adam Bartlett said during his H&W interview the players looked happier, they looked as though they want to perform for Hereford United. Meanwhile it was back in September 1975 that the Bulls last won at Saltergate. That day it was by 3-2 in front of 3,000 spectators and it was their first away win for nearly ten months. After yesterday the Bulls will never be defeated at that ground again. In truth the stadium probably hasn't changed much in all those years. There are still wooden bench seats with no backs in the main stand much like the old Doncaster stadium. And the away terrace, not used yesterday, remains uncovered. However the helpful stewards decided that the Hereford supporters could sit under cover. This was a move Chesterfield might have regretted as 150 or so fans situated in a small area were able to make quite a lot of noise which manager Graham Turner acknowledged several times during the afternoon. Just one blot on the copybook - the fan who suggested new loanee Astrit Ajdarevic was a 'Leicester Reject'. Shame on you. Hereford United produced a fine attacking performance at Saltergate this afternoon to come home with three deserved points through second half goals from Jake Jervis and Marc Pugh. Graham Turner gave Jervis his first start meaning Gavin McCallum dropped to the bench in an otherwise unchanged line-up from the Bradford match. New loan signing, Astrit Ajdaravic had to be content to join the substitutes. An early probing ball down the left from Valentine found Marc Pugh but the move came to nothing. Then Jake Jervis showed good intent with a determined run before finding Lunt who nicely laid off to McQuilkin but the midfielder saw his effort rise over the bar. Chesterfield tried to counter but the ball was intercepted by Valentine who played a quick one two with Pugh before delivering a driven cross to the near post where Jervis was unlucky to see his clever deflection whistle passed the foot of the post. McQuilkin conceded a free kick about 30 yards out which brought jeers from the visiting Herefordians as referee Woolmer marched out the ten yards in Gestapo-like fashion. However, on-loan Ishmel Demontagnac blasted his effort comfortably over before Boden found Bartlett reacting quickly to block when through on goal. Jake Jervis was on the end of a clattering from Welsh International defender Rob Page as the youngster duped the former Cardiff man. Naturally, Woolmer saw little wrong with the challenge. Wade Small then found himself one on one with Bartlett but blazed the chance over the crossbar from just 15 yards out. Lewis Young then showed a clean pair of heels to the pedestrian Page before chipping his shot inches wide with ‘keeper Tommy Lee stranded. Manset fed Jervis and his crisp shot was blocked away by Lee before The Beast unleashed a dipping volley from 20 yards which cannoned off the bar with the keeper beaten before Kenny Lunt released Jervis but the striker shot over and McQuilkin was unlucky when his effort was just off target after a run of 40 yards. Lunt’s creativity was again involved when his pass to Manset was edged on to Jervis but his low drive was hacked away by the increasingly desperate home defence. With The Bulls having dominated the first period and produced so many shots without reward, the fans debate over the halftime coffee involved concern that we hadn’t got a goal or two to show for the team’s excellent efforts. The concerns were very soon eased. Kenny Lunt dinked a ball through to Pugh and as the Bulls’ wide-man advanced into the box he was hauled down by Picken. Woolmer pointed to the spot but, remarkably, failed to produce his traditional red card despite Picken being clearly the last defender and Pugh being through in the centre of the area. Bulls’ fans were left to assume that Woolmer had maybe suffered a flashback and spotted a covering Tony James out of the corner of his eye. Jake Jervis stepped up to blast the ball into the net despite Lee getting a despairing hand to it. Shortly afterwards, Pugh was again hacked down from behind as he sped towards goal but this time Woolmer’s blind eye was the only one open. Manset flicked a header on to Jervis but his shot was blocked and Pugh’s reaction chip went just over. When Chesterfield broke upfield, Lunt chased half the length of the field to get in a saving tackle before the dangerous Demontagnac outpaced Richard Rose to fire into the side netting. United forced a couple of corners without reward before doubling their lead with around twenty-five minutes remaining. Once again it was Kenny Lunt who produced a slide-rule pass into the path of Marc Pugh and the Bulls’ player ran into the box to slot calmly passed Lee from 15 yards. Then came another moment of incompetence from the referee. Pugh turn his full back inside out and as he shaped to cross, was pulled to the ground from behind when clearly in the box. Woolmer, of course, waved play-on. The Chesterfield right back received an ear bashing from his coach when Lewis Young got behind him. Jervis then turned Page left and right and had his shot blocked when a cross to the far post would have found Pugh hungry for his brace. Then, with just ten minutes remaining, Young showed a little inexperience with a rash challenge on Adam Rundle near the bye-line. Barry Conlon fired home the resulting spot-kick to provide a nervous few final minutes for the travelling Edgar Street faithful. Turner replaced the tiring Lewis with Sam Gwynne and also introduced Constantine in place of Manset who had received a bang on the foot. A couple of half chances at each end failed to produce any further addition to the score and The Bulls fans rewarded the efforts with plenty of applause as the team left the pitch with a well earned victory in front of 3593 supporters that included around 150 noisy ones from The Shire. This was as good a performance as we’ve seen all season. Bartlett, although rarely troubled, dealt well with everything thrown at him including a late goal-line block with his outstretched foot. The defensive unit were solid and the central-midfield pairing of Lunt and McQuilkin were in control for large periods of the game. Wide players, Pugh and Young were direct and pacey while Manset’s strength and Jervis’ impudence caused problems and threats that have been sorely lacking for most of the season. Three points from Saltergate, a team that smiled at the final whistle and a pint of 6.4% Thornbridge Britannia Cream in The Rutland. Marvellous. Chesterfield: Lee, Picken, Whing, Page, Breckin, Goodall, Talbot, Allot, Demontagnac, Boden (Conlon 52), Small (Rundle 71). Unused subs: Crossley, Gray, Austin, Bushel, Bowery. HUFC: Bartlett, Green, Jones D, Rose, Valentine, Pugh, Lunt, McQuilkin, Young (Gwynne 90), Manset (Constantine 85), Jervis. Unused subs: Adamson, Preston, Done, McCallum, Ajdaravic. Hereford United captain and goalkeeper Adam Bartlett speaking after the game said the squad was delighted with the three points gained at Saltergate. "We are delighted in the dressing room," Bartlett told BBC Hereford and Worcester. "We put in a big shift today and we've played them off the park. "Their goalkeeper has made some great saves but I wasn't troubled until around the 75th minute so that shows our dominance to come here and do that to a team that is up around the play-offs. "It was the plan to get their crowd's backs up especially after they were beaten here 5-0 by Port Vale. "When we had possession we retained it very well and got into some great positions. "That's a massive three points for us today. "Jake (Jarvis) has come in and was brilliant today. He and Lewis (Young) have got bags of potential and ability. "Pughy took his goal really well. "On another day we might have been four or five goal winners." Bartlett did have one major scare near the end of the game. "It was a little bit of luck. It was a good ball across and their big man should have scored at the back post. I was just able to stick my foot out and get a toe to it." Barlett went onto describe how the squad feels now Graham Turner is back in charge. "There is just a little bit more calmness. He's getting the lads more confident around the place. "Training has been spot-on. The atmosphere has been brilliant. "We are a happy group. Long may it continue." Finally Bartlett confirmed he would be at Edgar Street next season. "I moved down here in the summer and have enjoyed every minute of my first season in League football. "As far as I'm aware I'm here next season and looking forward to it." A very happy Graham Turner told BBC Hereford and Worcester that his side gave a 'magnificent performance' this afternoon against Chesterfield. "We had a fright late on after conceeding the penalty but the disappointment was that we didn't score more. "I thought some of our approach work, some of the movement, great runs from Pughy firstly for the penalty and secondly for his goal. "There just seemed a bit of freedom about us and the players looked as though they enjoyed doing what they have done today. "And when we were under the collar late on I thought there was some very good defending. I always thought there would be a problem with their big lads especially when Conlon went on but we dealt with it extremely well. "Against a decent side I thought we opened them up fairly consistently throughout the ninety minutes. We should have taken more of our chances, then maybe we could have enjoyed the last ten minutes of the match more than we did. "It's three points closer to safety and we've got to be pleased with that. "We generally controlled things and when we got possession we used the ball fairly well." Here are all the stats from this afternoon's game at Saltergate, the most ancient ground in League Two. Attendance: 3593 with 149 Hereford Supporters who were in fine voice. On loan Bull Lee Morris was an unused sub for Forest Green as they beat Altrincham. David Brown scored and was sent off for two bookings. John Eustace scored for Watford as they drew with Middlesboro. Craig Stanley scored Morecambe's second as they beat Torquay. Nick Chadwick scored the opener as Barrow beat Eastbourne. In Conf North both Mark Beesley and Danny Carey-Bertram scored for AFC Telford as they beat Hyde 4-0. Darlington won 2-0 at Shrewsbury to keep alive their slim hopes of staying up, but the Quakers remain 16 points short of safety with 10 games left. Grimsby lost 4-1 at Rochdale despite laying on 500 free coach tickets for fans keeping them four points short of Cheltenham, who lost 1-0 at Macclesfield. The Silkmen are 11 points clear of the bottom two and two above Torquay, with the Gulls 2-0 losers at Morecambe, while Barnet are also on 42 points after a 1-1 draw with Burton. At the top Notts County beat Rotherham 1-0 to keep Rochdale's lead down to ten points. Bournemouth kept up the pace with a 2-0 win over fading Accrington, who slip seven points off the play-off pace. Of the four holding play-off spots this morning only Rotherham won, with Bury losing 2-1 to Aldershot. The Shots took Northampton's play-off spot with the Cobblers drawing 1-1 at Lincoln. Port Vale's faint chances are even fainter after they lost 1-0 at home to local rivals Crewe, while Bradford drew 3-3 with Dagenham to do neither side any good. In the Conference Luton hammered Hayes and Yeading 8-0 after scoring seven in the first half. Stevenage won 3-0 at Crawley to retain a five point lead over Oxford, who beat Gateshead 2-1. Forest Green beat Altrincham 4-3 after losing 3-1, while Kidderminster lost 1-0 at home to Salisbury. In the League One drop zone Stockport are 15 points adrift with eight to play after losing 5-0 to Millwall. Wycombe need seven points after a 1-1 draw at Colchester. Tranmere are a point short of safety after losing 3-0 at Brighton, as are Southend after their 3-3 draw at Bristol Rovers. Hartlepool are their target after losing 1-0 at home to Swindon, with Exeter moving clear of the bottom four with a 2-1 win over Walsall. The Bulls beat Chesterfield 2-1 in today's League Two match at Saltergate. A Jake Jervis penalty and Marc Pugh's goal gave the Bulls a comfortable looking lead, but Barry Conlon's penalty at the other end set up a nervy final ten minutes that saw Bartlett paw a Conlon shot off the line with the striker celebrating a goal. The Bulls are up to 17th in the table, and are 13 points clear of the drop zone. Bournemouth got their transfer embargo lifted in time to extend Rhoys Wiggins' loan spell from Norwich until the end of the season, but all is not well at the club. The Supporters Trust has launched a donation scheme to launch a phoenix club should the current club go bust, much to the annoyance of the current club. An official club statement warns supporters against donating, calling the scheme 'counter productive'. In recent weeks the club have refused to meet the Trust to answer questions on funding. Yeovil are to restructure their internal workings after retaining the services of Chief Executive Martyn Starnes, who was interviewed for the same job at Brentford. Fans are currently frustrated that the claimed development of Huish Park, to 14,000 seats by 2012, has not got off the ground and there is still no social club at the ground. While most sides haven't even thought about selling them, Bradford have their season tickets for next season not only sold but also available for collection from the club. In a late piece of transfer news, Barnet have signed New Zealand international Chris James on contract until the end of the season. The 22 year old is a former Fulham trainee who has been playing in Finland. He hopes to play for the Kiwis in the World Cup. Histon's board have called in the Police to probe the running of the club under the former regime after a complete audit found serious irregularities. Former John Trewick target Kristian O'Leary has joined Wrexham on a month long contract. Weymouth have agreed a CVA after 80.9% of creditors agreed to a 9p/£ pay-off of debts over five years. The deal will see the club pay off just £80,000 of a £900,000 debt. Forest Green have agreed a settlement with the taxman over their historic debt, but the club 'is a long way from being safe'. They must pay 40% of the debt owed by April 7th. Hereford United manager Graham Turner has a virtually fully fit squad of players to choose from for this afternoon's League Two match at Chesterfield. In fact his biggest problem could be deciding who to leave out of the starting eleven. Last Saturday he started with Mathieu Manset and Gavin McCallum up front but McCallum may be dropped to the bench and replaced by loanee Jake Jarvis who impressed when he came on and scored. Latest loanee signing Astrit Ajdarevic could start in mid-field alongside Kenny Lunt with James McQuilkin named as a substitute. No doubt Turner will also want to give another loanee Lewis Young another game on the wing. And with the two young loanee defenders, Paul Downing and Daniel Preston missing out last week and attacking midfielder loanee Craig King also absent, Turner has plenty of options. This afternoon is the last time the Bulls will play at Saltergate and it would be good to come away with at least a point. Chesterfield's recent form is no better than Hereford's so a close game is envisaged. For those not watching the game in person there are the usual ways to keep up with the action. Keith Hall will be at the game for BBC Hereford and Worcester and both Gregg Davies and Jamie Griffiths will be there for the subscription based Bulls Player. Graham Turner has given BBC Hereford and Worcester an insight into why he didn't sign a particular player yesterday. "We tried to negotiate last week but his agent felt he could get a bigger club than us. "Just before the deadline we had the phonecalls asking if we were still interested. "And I thought then that is the wrong reason just to come to us. "He's coming to us because he can't get anywhere better and I don't like that. "I like the attitude of the three lads we have taken. They know of our record, they know of our reputation and they want to come and play here. "And I'm delighted with them." The BBC weather experts are predicting light rain showers during The Bulls match at Saltergate tomorrow afternoon. The visitors terrace does not offer the luxury of covered accommodation so you are advised to take a rain-proof coat with you. Chesterfield have, on previous visits, allowed fans to use part of the main stand when the weather has been inclement. Hereford United manager Graham Turner has said that if possible he would like to finish this season in the top half of the League Two table. After the Chesterfield match tomorrow the Bulls play three winnable games in eight days but Turner is well aware that, as yet, the Bulls are not quite safe from relegation. "To the outside world a ten point cushion between us and the relegation places is sufficient not to worry," Turner told BBC Hereford and Worcester. "But inside the club we know if we lose a couple and Grimsby start winning that gap becomes very narrow. "But I think the confidence of beating Bradford, the players we have bought in and a good attitude to work will see us safe. "I think after Chesterfield it is a crucial eight days for us when we play Barnet, who are around us in the League, we play Darlington who are bottom and then we play Grimsby who are second from bottom. "That is a big eight days for us and if we can secure good points from those three games and the Chesterfield one then we'll enjoy the run in until the end of the season. "Top half of the table is the aim." Former Bulls’ defender John McCombe has made the League 2 team of the week as selected by the Press Association. The full team is: Schmeichel (Notts), Ogogo (Daggers), Edwards (Notts), McCombe (P Vale), Brown (Shots), Green (Daggers), Walker (Rotherham), Jones (Rochdale), Davies (Northants), Somma (Lincoln) and O’Grady (Rochdale). Graham Turner is hopeful his team can take at least a point from Chesterfield tomorrow on the back of recent better performances. "Chesterfield are up in the play-off positions and the reports suggest they are a good side," the Hereford United manager told the Worcester News. "We have got the confidence from the win against Bradford and played well in the second-half against Morecambe. "We will go into the game buoyed by the victory and, despite the fact they are going well in the league, we will expect to get something out of the game." Turner has also spoken about his squad. "We have strengthened the squad over the last week or so and I am hoping that will be sufficient," he said. "I think the squad is stronger and we have got enough, with the cushion between us and Grimsby and the quality of players we have brought in, to steer ourselves clear of relegation." Trevor Benjamin is on the move again, this time joining up with Norfolk side Wroxham. It is barely a month since he signed for Bedlington Terriers, but the 31 year old has now racked up club no.27 in the shape of Ridgeons League Premier side Wroxham, making his home debut in front of 75 people with a 3-2 win over Wisbech Town. Herefordshire Cider Makers have been dealt a strong blow by chancellor Alistair Darling who proposed a rise in the duty on the drink in his budget earlier this week. It is well known that a number of Hereford United supporters enjoy a glass or two of scrumpy and they will be penalised by the tax rise. Hardest hit will be the stronger varieties which are over 7.5% proof which could see the tax rise on them from around 50p a litre to over £2. Less strong varieties will increase by between 5p and 10p a litre. However the industry, which employs a number of Hereford United supporters, has launched a number of initiatives against the proposed increases. One is to designate next Sunday as Cider Sunday. It is the last day before the price of a pint will rise by up to 20p a pint. Another already started is a Downing Street petition launched and a third is a Facebook campaign to get the Worzel's classic 'I am a Cider Drinker' to number one in protest. Westons Cider commercial manager Roger Jackson said he was “extremely disappointed” with the tax increase. "While the increases in duty have hit all forms of alcohol, cider and perry have clearly been singled out. This could be devastating for the cider industry and to our already fragile rural economy," Jackson told the Worcester News. "In the last few years, cider has been a great success story. The investment and innovation in the industry as a whole has doubled the value of the cider market and doubled the contribution we have made to government; all that is now at risk." The Bulls travel to Saltergate for the last time on Saturday for a League Two match. The last trip to Chesterfield was an unhappy one. With the Sky cameras present the Bulls were thumped 4-0 with Jack Lester scoring twice in January 2008. It's hasn't been an awful lot better in previous seasons, with the Bulls travelling on Saturday looking to break a run of eight straight losses to the Spireites on their home patch. It was September 1983 when the Bulls last earned a draw at Saltergate, and September 1975 when they recorded their only win at the doomed ground. Saltergate will be no more next season. The £13million 10,000 capacity B2Net Stadium, built on the site of an old glassworks, will replace the ageing ground that has been home to the Spireites since 1871. On the pitch the club hope to see off the old ground with a promotion celebration. They currently lie fifth, four points inside the play-offs and four points short of an automatic spot. Veteran striker Jack Lester remains the club's leading scorer this season, with eight goals, but he has only been seen once on the pitch in 2010 due to injury and they have struggled for goals without him. They have just four goals in their last six games, earning a less than stellar seven points from 18 to fall out of the race for the automatic promotion spots. The Bulls will travel with new found optimism after a strong performance against Bradford. Graham Turner will hope that his latest international recruit will have a similar effect to the two that arrived for the Bantams match. The Yugoslav-Swede is, by my reckoning, the twentieth different nationality to play for Graham Turner at Hereford United. Mark Pugh and Leon Constantine head the scoring charts with eight goals each, with the in-form Gavin McCallum on six. They'll all like to get into double figures before the end of the season. Chesterfield vs Hereford United, Saltergate, Saturday 27th March, 3.00pm. Hereford United travel to Chesterfield on Saturday but according to the bookies aren't favoured to return with any points. However after their comprehensive win over Bradford City last weekend there should be more confidence in the Bulls squad especially now that Graham Turner is back in charge of team matters. And Chesterfield were defeated 5-0 by Port Vale at home just two weeks ago. In fact they have only picked up one point in their last three games. Chesterfield coach Mark Crossley has been talking about Hereford United who visit Saltergate on Saturday. "I think they are very unpredictable," Crossley told his OS. "When we played them down at their place I thought they looked a good team if I'm honest. "But they've been languishing down near the bottom all season so they can't all be shining stars down there. "But we have to take the game to them. We're the home team and nothing but a win is acceptable really. "We need to win the game, there is no doubt about it." Hereford United have announced the signing of Leicester City attacking midfielder Astrit Ajdarevic on loan until the end of the season. The 19 year old former Liverpool trainee is a Swedish youth international. He played briefly in Swedish football before being picked up by the Reds and was farmed out on loan to Leicester 12 months ago before signing a permanent one year deal with the Foxes last summer. He made five sub appearances for the Foxes during the loan spell, including a two minute spell on the Edgar Street turf last April, but has not played for the first team this season. Darlington have interviewed Mark Cooper about their vacant managerial job. The former Kettering and Peterboro man has expressed an interest in the vacancy at Edgar Street but, with Graham Turner preferring to take his time on an appointment, Cooper has met Darlington chairman Raj Singh. The Northern Echo says ex-Bristol City man Gary Johnson, former Barnsley man Simon Davey, and ex-Yeovil boss Russell Slade have also expressed an interest in the post with Singh interviewing several candidates this week. Former Middlesboro defender Curtis Fleming, former Quakers boss Mick Tait, and ex-Bulls defender Kevan Smith - a former Darlington captain - watched their Tuesday loss to Aldershot and are all in the frame. Singh wants to name a new manager as soon as possible so that they get a chance to assess the current squad and build for next season ahead of their almost inevitable relegation. Bournemouth hope to clear their transfer embargo before today's 5pm loan deadline after announcing they have cleared their latest tax bill. They cleared the £314,000 debt last night and sent further monthly payments to the taxman as well in the hope of being able to bring in new players to bolster their threadbare squad. It is currently unclear quite where they have got the money from. Bradford will not be extending the loan of striker Mark McCammon from Gillingham. The player is surplus to requirements with the Gills and is available for another loan move. Grimsby have loaned defender Peter Bird to Boston for a month, but have seen loanee Paris Cowan-Hall end his injury his spell at Blundell Park. Cheltenham have extended the loans of Bristol Rovers defender Aaron Lescott and Colchester forward Medy Elito until the end of the season, and taken Millwall's teenage striker Kiernan Hughes-Mason until the end of the season. They have also brought in former manager Jim Barron as goalkeeper coach until the end of the season and signed former midfielder Scott Brown on non-contract terms. The 24 year old has been out of the game since breaking a leg playing for the Robins in 2008. Chester fans have decided to name their new club Chester Football Club after a vote. It was the original name for Chester City until they added the City in 1983. The local council have set a deadline of April 19th for interested bidders to make offers for use of the Deva Stadium. FC United of Manchester want to develop their own home ground in the Newton Heath area of the city. They currently share with Bury but want a 5,000 capacity ground on the current Ten Acres Lane sports centre. Port Vale have loaned three players out for the remainder of the season, and told all three their contracts will not be renewed in the summer. Ross Davidson and Danny Glover have joined Stafford, with Luke Prosser joining Kidderminster. They have also told teenage goalkeeper Daniel Lloyd-Weston he will not be offered a new contract. The Valiants have signed Southampton defender Lee Molyneux on loan until the end of the season with a view to a permanent summer transfer. Dagenham have loaned striker Wes Thomas to Rushden for a month. The 23 year old had a similar spell at Grays earlier in the season. Rochdale have signed former Chester defender Michael Lea on non-contract terms. Rotherham have signed teenage Leeds defender Liam Darville on loan for the rest of the season. The 19 year old is yet to make a first team debut. They have also loaned out striker Ryan Taylor to Exeter for the rest of the season. Bury have signed Man City winger James Poole on loan until the end of the season. The 20 year old has just signed a new deal at Eastlands. Chesterfield have loaned midfielder Lloyd Kerry to Kidderminster for a month. The 21 year old previously had a similar spell at Alfreton. Aldershot have signed MK Dons forward Dean Morgan on loan until the end of the season. The Hereford Times has reported that Lee Morris will stay at Forest Green for the remainder of the season. It was originally announced as being a loan move for a month but the paper says the deal is until the end of the season, effectively ending Morris' stay at Edgar Street. Morris scored on his debut for the Gumpers, but was only a 68th minute sub in their midweek win. His only other goal since signing for the Bulls was for Mansfield in December. Stockport have until August 6th, the day before next season kicks off, to get out of Administration. Manager Gary Ablett has told the local press that they have eight weeks to agree a deal to allow the paperwork to be done, or they face breaking FL rules on being in Administration for two successive season starts. Hatters fans believe the Jim Melrose bid is now dead in the water. Lincoln chairman Stef Wright is to quit the role at the end of the season. He will leave the board after ten years, five as Chairman, but has not offered a reason for his departure. Notts County have accepted they will not get their transfer embargo lifted this season. The embargo was put in after their court dates with the taxman, but will remain due to the exceptionally high wage bill at the club. Weymouth could be set for another takeover with former bidder Chris Ryan interested again in the club. 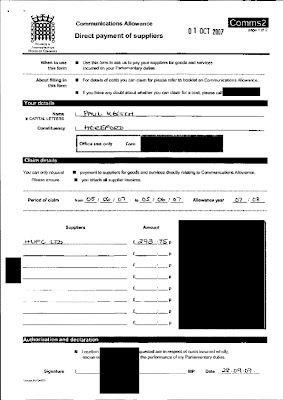 The club face a CVA on Friday offering 9p in the £ of debts to creditors over five years. Ryan, also a creditor, says he will object to the plan if current owner George Rolls does not agree to a joint ownership of the club with him. Cheltenham are trialling former Lincoln defender Aaron Brown. Crewe will shrink the size of their first team squad in the summer due to budget cuts, and will rely more on their Academy side as back up. It's eleven years ago this weekend that a group of Herefordshire councillors were taken by Hereford United supporters to see the (then) new stadium at Rushden and Diamonds. The idea behind the tour was to try and enlist councillors support for new facilities at Edgar Street which all these years later look as though they are finally on their way. Terry James was council leader at the time and had just proposed plans for the redevelopement of Hereford City Centre. Chairman Max Griggs and his fellow directors at Rushden gave the group a guided tour of the facilities and a hospitality package comprising lunch and grandstand seats. The councillors together with close to 1000 Hereford United fans later watched the match which ended without a goal being scored but was 'a very entertaining affair'. They were said to be 'overwhelmed by the passion of the Hereford supporters' as well as being 'impressed with a modern ground development fit for the 21st Century'. Chesterfield manager, John Sheridan, will be sat in the stands on Saturday when Hereford United are the visitors to Saltergate. Sheridan was found guilty of misconduct by the FA following an incident at the recent highly charged game at Notts County and has been handed a two-match touchline ban. He was also fined £500. Sheridan is said to have made comments within earshot of the fourth official and was sent to the stands by the referee. The Spireites boss missed the Burton game and will serve his second suspension during The Bulls match on Saturday. Paul Keetch appears to have received the money he paid for advertising in the Hereford United match programme back from the taxpayers. 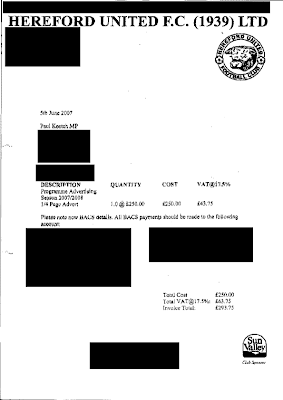 The Liberal Democrat MP for Hereford claimed £293.75 for the 2007/8 season as part of his communication allowance. Currently he is still advertising in Bullseye. Darlington continued their slide to the Conference with a 2-1 home loss to Aldershot in front of another new low crowd of 1,296. Macclesfield stay below the Bulls after losing 3-1 at Rotherham. Bradford dented Notts County's charge for promotion with a goalless draw at Valley Parade, and Burton reduced Accrington's hopes of a play-off spot with a 2-0 win. In the Conference Forest Green won 3-1 at Salisbury to ease their relegation worries slightly. At the top Stevenage won 2-1 at Grays to extend their lead to five points, while York beat Kidderminster 1-0 to get their play-off hopes back on track. At the foot of League One Southend beat Walsall 3-0 to move within a point of safety, but Harlepool lost 3-2 at Southampton to stay within range of the drop zone. For the record we reproduce those parts of recent meetings of the FLA (Football Licensing Authority)when Hereford United has been discussed. The authority is quite slow in releasing details of its meetings so more information may be available in good time. Hereford United – The club had been promoted from the Football Conference at the end of the 2005/06 season. In line with FLA policy the club had been given three seasons to bring its terraces up to the prescribed standard. However three areas, the Blackfriars Terrace, the Merton Terrace, and the Len Watson Terrace, remained non-compliant. As a result of recent tests of the crush barriers on all three terraces the local authority had set a zero capacity for the Blackfriars Terrace. The Board considered the case for licensing the two remaining areas, the Merton Terrace and Len Watson Terrace. Taking into account the information before the Board, it was minded to allow the club a further 6 months to bring the standing accommodation on the Merton Terrace and Len Watson Terrace to required standard. Any areas of non-compliant terracing remaining at the end of January 2010 would not be licensed and the club would be required to take them out of use. The Board confirmed that it would not grant the club’s request that the level area at the front of the Merton Terrace should be licensed as viewing accommodation. Hereford United – the Board had granted the club a further 6 months to bring the standing accommodation on the Merton Terrace and Len Watson Terrace to required standard. The club had been advised of the standard. The onus was on Hereford United FC to demonstrate, before January 2010, that the upgrade to the terracing was complete for an amended licence to be issued or that work was significantly well underway for a further period of dispensation to be considered. Lord Mawhinney will become Honorary President of the Football League after he steps down from his role as Chairman on April 7th. Greg Clarke will become the new chairman the following day and he will chair his first board meeting later that day. Mawhinney steps down after seven years at the helm. Ex-Bull Dean Beckwith has triggered a new one year deal at Northampton after reaching 30 League appearances. Fellow defender Craig Hinton has also earned a contract for next season. Port Vale have extended the loan of striker James Lawrie to Kidderminster for the rest of the season. Grimsby have extended the loan of Hull striker Jamie Devitt until the end of the season after three goals in seven games during the first month. Cheltenham have signed a new two year deal with shirt sponsors Mira. Torquay have lost the services of loan winger Lloyd Macklin after Swindon declined a request to extend the deal. The Gulls hope to sign a striker before Thursday's deadline. Former Bulls trialist Ryan Burge has failed to turn up to play for current club Worcester. Since trialing with the Bulls Burge has taken in spells at Barnet, Japanese football, and Glenn Hoddle's academy side. Forest Green's Supporters Trust has criticised the club for keeping a 'low profile'. The Trust say the club does little to market itself or it's facilities, and the Trust has been responsible for most of the marketing in recent years. Lincoln have extended the loan of Leeds striker David Somma until the end of the season after five goals in five games. Hereford United have announced that Jamie Tolley has left Edgar Street by mutual consent. The former Macclesfield man started just six League matches for the Bulls due to an assortment of injuries, making a total of 13 starts and sub appearances in League and cups. He was a surprise starter in place of Kenny Lunt in John Trewick's last game, with Lunt dropped by Trewick due to his contract situation, but has not even made the bench in Graham Turner's three match reign. Hereford United's Graham Turner is one of three people proposed to be given the freedom of the city assuming the council ratify the idea on April 20th according to the BBC. Clive Richards CBE, Graham Turner and Major James Hereford will be honoured at separate ceremonies in the summer, Hereford City Council said. Hereford United would not have survived in the Football League without Mr Turner's "total commitment" to the club as manager and chairman, the spokesman added. Councillor Sylvia Daniels, Mayor of Hereford, said: "I am delighted that the council has decided to honour these three men, who in very different ways have each made a lasting and important contribution to the city and its people." Saltergate for the last time. With The Spireites due to move to a new ground next season, this will be the last chance for Bulls fans to visit this classic lower league stadium. “The Rec” or Saltergate as it is more often known has been the home of Chesterfield since 1871 when their first visitors were Rotherham. Because of the impending move, little has been spent on new paintwork, repairs and home comforts in recent years so Bulls fans will feel at home in these familiar surroundings. The visitors end is an open terrace, which can be a bit bleak on a cold March afternoon, but they’re a friendly lot in Chesterfield and usually provide ample seats in the end of the main stand. The good news about the new stadium is that it is still in an area served by decent Pubs and chip shops (Slops take note). Interestingly, Chesterfield have already sold every seat in the stadium for their final home game before their move. Admission is believed to be £16 for adults, £10 for concessions (Over 65’s and U18’s) and £7 for juniors (U14’s). Seats are £18, £13 and £12. Chesterfield is a good day out although their “finest” do have a reputation for videoing everything that moves. HUISA – Departs from Radford’s at 09.30 with a fare of £17 (Members £16). Bookings through Club Office (08442 761939). CAR – To Worcester then M5, M42, A42 and M1. Leave the M1 at Junction 29 and take the A617 towards Chesterfield. On reaching the edge of the town centre go straight across the first roundabout and then the next, passing the famous Chesterfield Church with the crooked spire on your left. As the road divides, keep to your left, going around an open car park. This road leads into Saltergate, where you will pass the Barley Mow pub on your left and the Town Hall car park, before reaching the ground on your right. Parking is available in the Town Hall car park (£2.40 for 4 hours) with plenty of other parking in the streets around the ground. Distance is around 135 and you should allow 2 hours 45 minutes. Postcode S40 4SX. ALEHOUSES – Chesterfield boasts two Wetherspoons with the easiest reached being on West Bars. From Saltergate, walk down Clarence Road (Opposite the ground) and turn left onto West Bars where you will find The Portland Hotel on your left. In Saltergate you will find The County and The Barley Mow with the latter being not for the feint-hearted as the barmaids are reportedly often not overdressed. Walking down Queen Street from the back of the away end, you will find The Industry and a little further by turning into Newbold Road, The Chesterfield Arms. Both are understood to accept visiting fans. These Pubs all come recommended by other visiting fans but personally, I shall be attending The Rutland at 23 Stephenson Place (in the shadow of the famous Twisted Spire) where I expect to find a fine selection of real ale and good food. Shall I just say…Brampton’s Golden Bud, Titanic Anchor, Thornbridge Jaipur, Abbot, (minimum of eight in all) and Weston’s Old Rosie…nuff said. It's only just been launched but already there is a survey about Bulls Player, the extension to the Hereford United Official Website which supporters have to pay for. We strongly value your support and believe this relationship is two-way. Therefore, we would like to give you, our fans, the opportunity to express your views and opinions towards Club Player, the service that enables you to watch your club’s match highlights, receive live audio commentary and see exclusive interviews. You have been randomly selected from the official club database to take part in this survey. It is easy to complete and also gives you the opportunity to win an iPod Touch (8GB). The survey or research is being conducted on behalf of Football League Interactive by Sportswise, an independent sports market research company, in accordance with the MRS Code of Conduct. However what isn't made very clear is that it isn't only Hereford United supporters that are being surveyed. In fact it looks as though it's most of the 112 top clubs in the country. So the chances of winning that iPod, worth about £150, for giving them your view is highly unlikely. Nevertheless it does give supporters a chance to comment about Bulls Player. Always assuming that the survey has gone out to more than just one supporter who happens to contribute to Bulls News. Andy Woolmer from Northamptonshire has been appointed to referee next Saturday's League Two match between Chesterfield and Hereford United. Woolmer is well known to Hereford United and its supporters because of a certain sending off in a Conference semi-final. But that was a long time ago. However the last time the Bulls met Woolmer was at Millwall in late October 2008 and he didn't keep his cards in his pocket on that occassion either as he sent one player off from both sides. Referee Andy Woolmer was once again in the action, dishing out two red cards in the second half. Firstly Jimmy Abdou was sent off for a lunge on Clint Easton, before Nick Chadwick was shown his marching orders for a second bookable offence to level the teams up. To date this season he has been in charge of 24 games and given out 60 yellow and just 2 red cards. This Thursday is the deadline for loans in the Football League. The Bulls currently have five loanees on their books, of which defender Paul Downing and forward Craig King are confirmed to be staying for the rest of the season. Daniel Preston is currently scheduled to stay for another week, while the one month loans of Jake Jervis and Lewis Young will keep them here for six of the remaining nine games of the season. All three loans can be extended beyond the deadline to the end of the season if required. Only one Bull has gone out on loan so far this season, with Lee Morris following up his one month stint at Mansfield with a similar spell at Forest Green starting last Friday. Again, his spell away from Edgar Street can be extended to the end of the season outside of the loan window. Forest Green chairman Trevor Horsley has told the BBC the club needs a total of £300,000 to clear outstanding debts up to the summer. They need £100,000 to clear their current tax liabilities then a further £200,000 to settle debts due in the close season. Kidderminster are one of the ten clubs appealing against losing points from Chester. They hope the FA follows the precendent of the Northern League, who gave three points to any side who still had a game to play against a side thrown out. The local press have been scathing of Steve Staunton's reign at Darlington, calling the appointment 'calamitous' and the team the 'worst in the club's history'. Torquay have lost the services of winger Wayne Carlisle as he needs surgery on a knee problem that will rule him out for most of the rest of the season. Weymouth top scorer Jake Reid, recently departed for Salisbury, claims the club owes him nine weeks wages. The Terras face a CVA vote on Friday. Bournemouth's Supporters Trust has again questioned the running of the club in another statement issued yesterday. They say the board have refused to meet them after stating they would previously, and have not answered questions relating to their financial input and the future of the club. The Cherries face another court date in nine days. Bradford have extended the loan of ex-Bull Robbie Threlfall from Liverpool until the end of the season. Gateshead's management and players will reimburse the 31 travelling fans that witnessed their 8-0 drubbing at the hands of Rushden last weekend. Bradford City manager Peter Taylor wasn't too happy with the performance of his side at Hereford yesterday. His frustration nearly boiled over late in the first half when he received a telling off from referee Danny McDermid. "It's been very frustrating for me I am not saying we deserved to win but we did create more chances," he said. "The first quarter was okay but after that it was not good enough and I am very disappointed the way we played. "We're in 16th place in the table which doesn't lie and maybe we have had too many performances like this. But I have got to say goals do change everything and if we had scored when I thought we deserved to it might have been a different day." The official HUFC travel organisers, HUISA, will be running their usual transport to Chesterfield next Saturday. Departure from Radford’s is planned for 09.30 with a fare of £17. Seats can be booked through the Club offices during normal hours (08442 761939). Darlington have parted company with manager Steve Staunton this morning. Chairman Raj Singh issued the following statement: "It's with regret that we're having to part company with another manager during what's been a forgetful season for us, but we felt we were left with no alternative after yesterday. "It was a disappointing performance and result, but the most disappointing side to yesterday was the attendance - a record low crowd told us a lot. "We desperately wanted things to work out for Steve but it clearly wasn't to be and we'll have to take stock again. Our search for a new manager starts straight away." Saturday's gate of 1,463 was the club's lowest since 1993, and by far the worst in their current cavernous home. The club expects to place former caretaker bosses Craig Liddle and Neil Maddison in temporary charge until a new appointment is made. Staunton won just four of 25 games in charge after replacing Colin Todd in October. The Bulls visit the Darlington Arena on Easter Monday. Bulls News understands that the issue with Kenny Lunt’s contract has reached a two-part solution. Firstly, there has been a resolve to enable him to play for the remainder of this season and secondly, it is believed that there is now a revised offer on the table for the following campaign albeit at the reduced level of pay. His new option is expected to be valid until the 31st May. Lunt will be 31 in November and doubtless has a few years of League football left in the tank. Meanwhile, Gavin McCallum reported that he could still “feel” his knee after the match. McCallum has been playing through a slight medial ligament strain for some time. His withdrawal yesterday on 70 minutes is thought to have been partly to protect him from aggravating the injury and also to enable Turner to have a look at young Jake “Ricky” Jervis. “I thought Mathieu gave us something. He seemed to keep those around him on their toes because no one knows what he’s going to do. Also, there’s always a lift when someone new comes in. Lewis (Young) has only trained with us for a day so we weren’t sure what to expect from him but he delivered a few cracking crosses today and young Jake (Jervis) showed a touch of class with his finish. Hereford United defeated Bradford City yesterday and thereby registered their first home win since the visit of Aldershot just over a month ago. In fact since that match on Feb 16th the Bulls had taken just three points out of a possible twentyone, until yesterday. And it was pleasing to see nearly all the players, including Kenny Lunt who rushed off last Tuesday evening after the Morecambe game, applauding the supporters at the end of the game. The players with the exception of the two new young loanees were the same players as have been turning out for the Bulls for most, if not all, of the season. Only Mathieu Manset who didn't appear until late September, wasn't in the squad chosen by previous manager John Trewick at the start of the campaign. By the end of August Bartlett, Green, Rose, D Jones, Valentine, Lunt, McQuilkin, and Pugh had all started for the Bulls. And all eight were in Graham Turner's starting line-up yesterday. Of the others who started yesterday, Gavin McCallum wasn't a regular until mid-November and Lewis Young only arrived on Friday. So ten of the eleven who started yesterday were players signed by Trewick. Anyone who follows football knows that one win out of three, since Turner took over, doesn't mean that the tide has turned for Hereford United. But those who were at Edgar Street yesterday and on Tuesday evening saw a more determined effort by the Bulls. May be the players feel more comfortable playing under the guidance of Turner. May be the players have more respect for him. May be he has that knack of gelling the players together. May be his tactics are just that little bit better. Whatever the reason or reasons, supporters went away from Edgar Street yesterday sensing that some pride has been restored to Hereford United. May be it's the Turner Factor. Here's a few paragraphs from the boysfrombrazil site about Bradford's visit to Edgar Street today. As the 332 City faithful were making their way into the Edgar Street ground, you could hear the grumbling voices. The turnstiles were decidedly narrow; the facilities were poor; one end of the ground hasn’t got a safety certificate; even on the front row of the seated area it was impossible to see the whole pitch. It was, by common agreement, like going back to the old days. And so it would turn out for the rest of the afternoon. I should say at this early stage that Hereford United are in the bottom third of this league for a reason. Nothing I saw today persuaded me that they deserve to be much higher. And nothing I saw today persuaded me that they deserved to lose this game. City may well have had the worst of the elements in the second half, with the rain that stayed away until half-time suddenly driving into their faces, but there was nothing lucky about the two goals that the home team scored. The first, a header from Manset, came after City had failed dismally to deal with a corner, despite leaving no one upfield. The second, a well hit shot from Hereford debutant Jake Jervis, came as a direct result of a woeful header from Luke Oliver, leaving Matt Glennon hoping only for another of the mishit shots that littered the game.